The human body is an incredibly complicated machine, and its myriad processes and functions are still being researched and understood. Look beneath the surface of even the seemingly simple aspects of our anatomy and you’ll find intricate structures and multipart growth and development cycles. There is no better example of this than the human hair. One hair may not seem like much, but there is much more going on than it may appear. The shaft. This is the part of the hair we can see above the surface of the scalp. Each shaft has three layers. The innermost layer, the medulla, doesn’t have any particular function. But the second layer, the cortex is extremely functional and vital. It is comprised of the durable protein keratin which gives hair its strength and durability, as well as its ability to uptake water. The outer layer, the cuticle, protects the shaft and helps it repel water. The follicle. This tube-like pouch laying just below the surface of the skin anchors the shaft and attaches it to the skin. The hair root. The hair root attaches hair to the base of the follicle. The root is where hair actually grows and is nourished by blood capillaries. Like every other part of the body, hairs are comprised of cells. As new cells form at each hair root, they push the hair further out of the follicle. As new cells form at the root, the hair is gradually pushed further and further out of the follicle, and farther away from the nourishing blood needed for cell growth. Without this nourishment, hair dies. As hairs die, they are transformed into a hard protein called keratin. It is the follicle, which lies deep in the skin, that is indispensable for growing hair. Anagen phase. The first phase is the growing stage. Hair grows at about one cm each month, and the anagen phase can last between two and five years. Catagen phase. As this phase begins, the bulb detaches from the blood supply and pushes the hair shaft up. The catagen phase can last several weeks. Telogen phase. During this resting stage, which last about five months, there is no hair growth. At the end of the telogen phase, the hair sheds, and the follicle starts to grow a new one. At any moment, about 90% of the hair follicles of the scalp are growing hairs in the anagen phase while only about 10% are in the resting phase. Any disruption to hair’s natural growth cycle can contribute to hair loss. For example, if follicles shut down and stay in the resting phase instead of growing new hairs, there will be less hair on the scalp. Interference with the formation of new hair cells at the root during the anagen phase can also be a cause for hair loss, as can the destruction of follicles due to trauma or burns. Fortunately, there are effective ways to treat hair loss no matter what the cause. At the Hair Transplant Institute of Miami, our world-renowned hair restoration physicians have an unmatched understanding of the causes and treatment of hair loss and offer the most advanced and effective options for men and women alike. Temporary Hair Loss: Is It Normal? Is there such a thing as temporary hair loss? The question itself seems counter-intuitive. Thanks largely to the myths and half-truths of American pop culture, hair loss is something we typically associate with old men, and it’s a condition that seems to be permanent and irreversible. This is only partly true, however. Thinning, shedding, and balding affect both men and women of various different ages. Moreover, not all hair loss is permanent. In some cases, hair might begin to re-grow naturally. Still, it is imperative that men and women learn the difference between temporary hair loss and permanent pattern baldness, or androgenetic alopecia. On the one hand, research indicates that individuals who suffer with pattern baldness might also be genetically predisposed to other serious health conditions, like coronary heart disease. On the other hand, those who experience temporary hair loss are smart to diagnose it as such to avoid unnecessary stress and anxiety. Join Dr. Bernard Nusbaum is the video below for a brief overview of the four main causes of temporary hair loss. Then, scroll to the temporary hair loss FAQ section to review these concepts in greater detail. 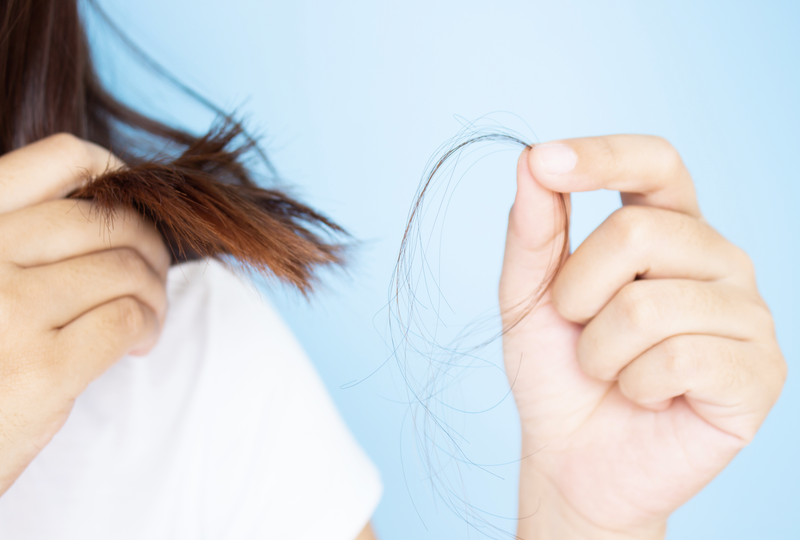 Below are a few of the most common questions regarding temporary hair loss and shedding. After taking a moment to review each, we invite you to leave additional questions or comments in the Comments section of this post. If think you’ve experienced “seasonal hair loss,” you are not alone. Women in particular report experiencing symptoms of thinning or shedding hair in late September and October. To better understand this phenomenon, it helps to take a moment to review the hair growth cycle. Hair grows in 3 distinct phases: Anagen, Catagen, and Telogen. Each phase lasts about 2-6 years, 2-3 weeks, and 2-3 months, respectively. Hair actively grows during the Anagen phase, and the Catagen phase is a separate and distinct growth phase that transitions hair into the Telogen phase. Once in the Telogen phase, hair experiences a period of rest. It is during this resting period, however, that hair can fall out. According to Swedish researchers, the reason for seasonal hair loss that occurs in the fall might be attributed to the fact that the hair and scalp experience a great deal of stress during summer months. As a consequence, the extra stress might “shock” hairs that are naturally in the Telogen phase, causing them to fall out 2-3 months later. And although the hair loss is perceived in the autumn, it might actually begin to occur in the summer. Can hair loss occur after pregnancy? Hair loss is a common occurrence after pregnancy. Many women experience this type of temporary hair loss due to 2 underlying causes: Hormones, and stress. New moms experience a rapid decline in estrogen following childbirth, which might trigger thinning or shedding. New moms are also predisposed to stress-related hair loss after pregnancy, which is referred to as telogen effluvium. One need not go through pregnancy and childbirth to experience telogen effluvium, however (see below). For more information, visit this article on hair loss and pregnancy. Can stress cause temporary hair loss? For more information, visit this article on female pattern hair loss and telogen effluvium. If you or a loved one is experiencing symptoms of thinning, shedding, or balding, contact the Hair Transplant Institute of Miami to schedule a comprehensive hair loss evaluation. Our team proudly represents South Florida’s top surgeons, registered nurses, technicians, and technologies. We understand the agony and frustration that accompanies hair loss, and we are committed to helping you develop a customized plan that will create natural results. Contact us online or call our Institute directly at 1.877.443.9070.